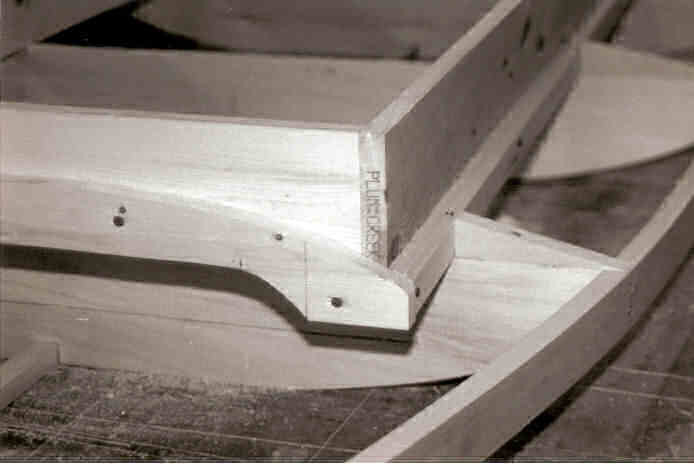 The duck boat plans consist of detailed step by step instructions with templates for the nose pieces, main ribs, deck support ribs and decoy rails. My plans are for a 14 foot double-ender (pointed on both ends). The construction is 1x and 2x lumber frame covered with 1/4" plywood then hand laid fiberglass. Width of the boat is 46" with a profile of less than 12". The cockpit is 7’ x 28" and is 9" deep. The weight of the boat will vary with the materials and how much fiberglass you use. My boats will weigh in at 110-115 lb. Of course that is before it has mud, shotgun shell hulls, and portions of several lunches underneath the floorboard. A person with modest construction skills can build this boat. The biggest stumbling block for some folks is the process of applying the fiberglass. You do not have to be an expert to apply a functional covering of fiberglass. A little practice will give you the techniques necessary for a functional and adequate covering. It would be helpful if you know someone who has some experience. If you don’t, talk with someone that works at a body shop. I purchase some of my supplies from a body shop. Along with that purchase you can get a lot of expert advice. Material cost for the boat will vary, but generally run between $350 and $450. The fiberglass materials have a wide range of price. Polyester resin may be $40/gal, but can be found for around $25/gal. or less. Epoxy resin is $60 to $90/gal. Some folks are interested in using a motor on their boat. Personally, I prefer to pole, but if I were in a situation where I had to pole long distances or cross a large expanse of deep water I would modify my design. Several people have modified my plans to a square stern boat; it is not hard. I have also built smaller boats in an effort to reduce weight. The small boats were lighter at 85 lbs., but they didn't pole as well, were not as stable, didn't have the load capacity and drafted deeper than the 14 ft. double enders. I decided to stay with the 14 ft. design and modify a trailer to handle the heavier boat (see trailer page).